Owens Corning (NYSE:OC) may not be a household name for investors, but you’ve probably used their products in your everyday life. The company is a global leader in roofing shingles, building insulation materials and fiberglass composites. The firm generates more than $7 billion in annual sales, has 20,000 employees, sells to 33 different countries and has been on the Fortune 500 list for more than 60 consecutive years. Unfortunately, Owens Corning stock hasn’t been a safe shelter for shareholders over the past year. If anything, the stock has developed a serious water leak, with shares tumbling from as high as $95 to just $52 now. But the downside seems seriously overdone. Here’s why OC stock can make a full recovery in coming quarters. Part of the reason that OC stock has struggled over the past year is that investors are worried about new home demand. After several robust years, the new housing market has slowed dramatically across much of the United States. It’s not hard to understand why. The Fed’s rather aggressive rate-hiking campaign caused mortgage rates to surge. This, in turn, caused prospective homeowners to delay or forgo new home buying decisions altogether. OC stock, like many other building-materials plays, slumped. This isn’t fair or correct on the market’s part, however. Owens Corning does not primarily rely on new home sales for its revenues. According to the latest corporate presentation, the company gets just 13% of its revenues from U.S. new residential construction. U.S. residential and remodeling is one-third of the overall business, with international sales being another third. The remaining 19% of revenues come from U.S. commercial and industrial uses. Thus, tying OC stock’s fate to that of the home-building market makes little sense. The good news doesn’t stop there. The company’s bread-and-butter business is roofing. Within roofing, more than 80% of revenues come from home repair and maintenance. This is recurring revenue, rain or shine. Roofs get old, they get hit with hail, excessive snowfall and the like. Regardless of the economy, people need to keep their roofs weatherproof. Roof sales for new homes make up less than 10% of revenues. The company has another business, composites, that has very little exposure to the housing market at all. Within composites, 58% of sales go to international markets, while 29% of revenues come from U.S. industrial and commercial buyers. Again, that’s solid diversification away from housing. Only insulation draws a major chunk of revenues from new homes, but, even there, international is a bigger buyer as well. Make no mistake, OC stock is powered by a diverse and robust line of businesses. Interestingly enough, all three primary business lines had between $2 billion and $3 billion in sales in 2018, showing how the company isn’t overly reliant on any one business segment or end customer. As a result of the shellacking over the last year, OC stock is now trading at a compelling valuation. In fact, it is selling for just 10 times trailing earnings and 9x forward earnings. That’s right, despite the huge drop in the stock price, Owens Corning’s earnings are still set to increase nicely in 2019. If you’re wondering how Owens Corning has traded historically, it looks very cheap on that metric as well. OC stock hasn’t sold at this low of a P/E ratio since 2011. Between 2014 and last year, it tended to trade in the 17-20x earnings range, while periodically moving above that level. Merely returning to 18x earnings would imply that that stock doubles in fairly short order. Other metrics support the notion that Owens Corning is cheap as well. For example, it is selling at less than 1x sales, which is generally cheap for a building materials company, particularly one that is not so levered to the more volatile new housing cycle. It is also selling at a PEG ratio of less than 1, suggesting that analysts are relatively confident of future earnings growth, rather than the current valuation being a so-called value trap. Finally, the company, while never known as a dividend stock, hit its highest level of dividend yield to date during the 2018 correction and is still paying a close to 2% annual yield. Despite the battered stock price, OC stock still offers a great deal of value for shareholders. For one thing, the company is getting serious about shareholders returns. The company has cut costs and used the savings to pay the dividend and simultaneously pay down debt. Additionally, the company has suggested that it may have wiggle room for a stock buyback in 2019 as well. Its cost savings have almost doubled profit margins from a decade ago, setting up a rather attractive growth trajectory when combined with a starting P/E ratio of 10. There’s no guarantee that OC stock will soar in 2019. 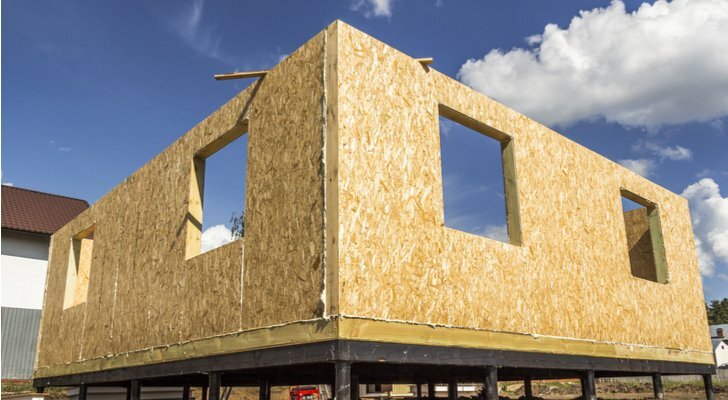 The new housing market may remain subdued for quite awhile, leaving Owens Corning’s stock sector out to dry for the time being. Eventually though, the market should wake up to the strong earnings and improving prospects for the dividend and potential share buyback going forward. At 9x forward earnings, it doesn’t take much for shareholders to win here. Article printed from InvestorPlace Media, https://investorplace.com/2019/04/owens-corning-when-roof-caves-in/.